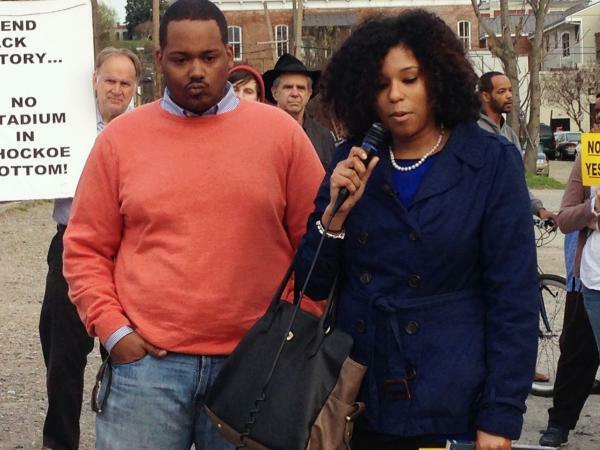 Ana Edwards, the chief opponent of the Shockoe Bottom stadium proposal, talks about historical markers at the Lumkin Jail historical site in Richmond, Va.
Cousins Linsey Williams and Justin Dixon Northup Gilliam, the great, great, great, great grandchildren of Solomon Northup, have entered the debate about what to do at Shockoe Bottom. 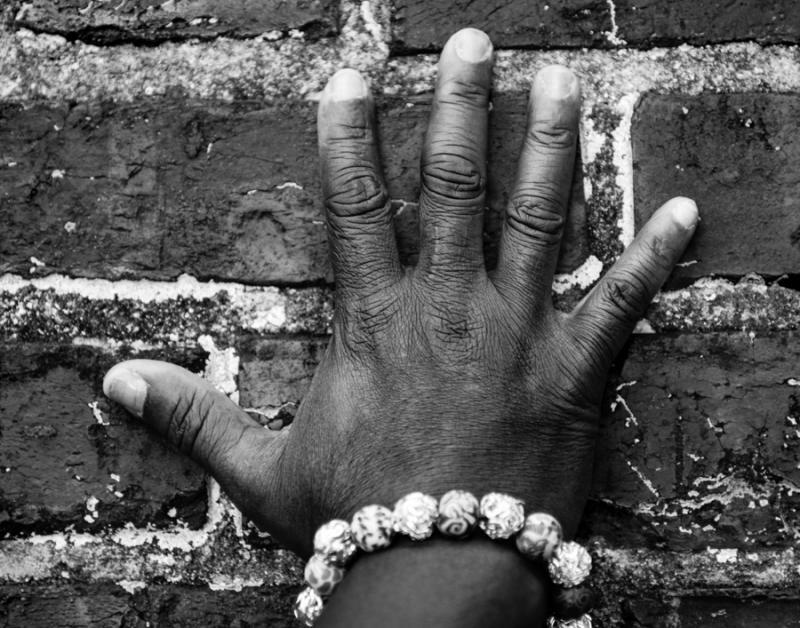 Richmond, Va., was once a hub for the slave trade in this country. Today, some residents of the city want to remember this history by preserving an 8-square block area, Shockoe Bottom. Wilayto wants to preserve the old buildings where lawyers, insurance brokers, newspapers and jailers made profits from slavery. Richmond's mayor, Dwight Jones, can't see setting aside 60 acres for a slave memorial. Instead, he'd build a museum as part of a much larger commercial and residential redevelopment, with a new stadium for the city's AA baseball team, the Flying Squirrels. "We are expecting the development in the Shockoe neighborhood to pay for itself," says Grant Neely, the mayor's spokesperson. "The tax revenue generated by the grocery store, the hotel, the apartments, any parking will be sufficient to cover the costs of constructing the ballpark." In building the stadium, he says, the city can fix flooding problems that have, to date, discouraged development in the area. Ana Edwards, who chairs a coalition of historians, artists, anthropologists and activists, says putting a ballpark in the neighborhood would detract from what Richmond should be doing. "We need to deal with this history," Edwards says. "Not only do we then get to honor the people who came before us, but we also get to understand them and ourselves. If we don't bring this history back, Richmond will always struggle through this identity crisis that it has." Richmond's mayor has called for an archaeological study of the site, pledging to honor any significant areas it might find. One that's already been identified is the slave jail where Solomon Northup, author of Twelve Years a Slave, was likely held, and his great, great, great, great grandson Justin Dixon Northup Gilliam, has joined the fight. "I want the history to be preserved. I want the community to be involved in it as well. I want the country to know what's here," says Justin Gilliam. "A lot of us don't know our blood lines and they may have had ancestors come right through here, never known it." Phil Wilayto thinks Richmond would be wise to invest in its history. "In the long run the city will see far more revenue from tourism than you ever would with a minor league ballpark that draws 60, 70 percent of its fans from the nearby counties," Wilayto says. "It's not rocket science. It just takes thinking beyond stupid, which is what this city government seems to be stuck on." But Neely in the mayor's office says that the proposed museum can only succeed as part of a neighborhood with other attractions. "For example, the Lorraine Hotel in Memphis where Dr. King was killed, that became a museum roughly 20 years ago. It had a great first couple of years, but then attendance really dropped off," Neely says. "Now it's a part of a thriving neighborhood and the museum is doing very well." This summer, Richmond's city council is expected to vote on whether to proceed with stadium construction. There was a time when Richmond, Virginia was a hub for the slave trade. Historians estimate that more than 300,000 Africans were sold there. Now, some residents want to honor them by preserving an eight-square block area in the neighborhood called Shockoe Bottom. Richmond's mayor supports building a museum but also wants the land developed to include a new baseball stadium. SANDY HAUSMAN, BYLINE: On a warm spring night, more than 150 people gathered in Shockoe Bottom, a name taken from the Native American word for the site. This part of town, bounded by Interstate 95 and bisected by railroad lines, was central to a city that prospered from the slave trade. PHIL WILAYTO: The best guestimate is several hundred thousand people were sold out of Shockoe Bottom. Probably the majority of African-Americans today could trace some ancestry to this small piece of land. HAUSMAN: Phil Wilayto is a leader of the grassroots movement to establish a memorial park here; preserving old buildings where lawyers, insurance brokers, newspapers and jailers made profits from slavery. 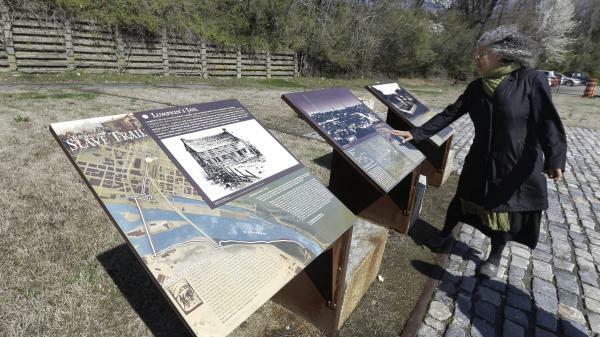 Richmond's Mayor Dwight Jones can't see setting aside 60 acres for a slave memorial. Instead, he'd build a museum as part of a much larger commercial and residential redevelopment, with a new stadium for the city's Double-A baseball team, the Flying Squirrels. Here's Jones' chief of staff Grant Neely. GRANT NEELY: We are expecting the development in the Shockoe neighborhood to pay for itself. The tax revenue generated by the grocery store, the hotel, the apartments, any parking will be sufficient to cover the costs of constructing the ballpark. HAUSMAN: And in building the stadium, he says the city can fix flooding problems that have, to date, discouraged development in the area. ANA EDWARDS: We need to deal with this history. Not only do we then get to honor the people who came before us but we also get to understand them and ourselves. If we don't bring this history back, Richmond will always struggle through this identity crisis that it has. HAUSMAN: Richmond's mayor has called for an archaeological study of the site, pledging to honor any significant areas it might find. One that's already been identified is the slave jail where Solomon Northup, author of "12 Years a Slave," was likely held. And his great, great, great, great grandson Justin Dixon Northup Gilliam, has joined the fight. JUSTIN DIXON NORTHUP GILLIAM: I want the history to be preserved. I want the country to know what's here. It's a connection that people can have to what happened so, so long ago. And for a lot of us that's very hard to come by. A lot of us don't know our ancestry. A lot of us don't know our bloodlines, and they may have had ancestors come right through here and never even known it. HAUSMAN: And Phil Wilayto thinks Richmond would be wise to invest in its history. WILAYTO: And in the long run, the city will see far more revenue from tourism than you ever would with a minor league ballpark that draws 60 to 70 percent of its fans from the nearby counties. It's not rocket science. It just takes thinking beyond stupid, which is what this city government seems to be stuck on. HAUSMAN: But mayoral spokesman Grant Neely says the proposed museum can only succeed as part of a neighborhood with other attractions. NEELY: For example, the Lorraine Hotel in Memphis where Dr. King was killed, that became a museum roughly 20 years ago. It had a great first couple of years, but then attendance really dropped off. Now it's a part of a thriving neighborhood and the museum is doing very well. HAUSMAN: Richmond City Council is expected to vote on whether to proceed with stadium construction this summer. For NPR News, I'm Sandy Hausman in Richmond. WUNC has been running a series called My Teacher. 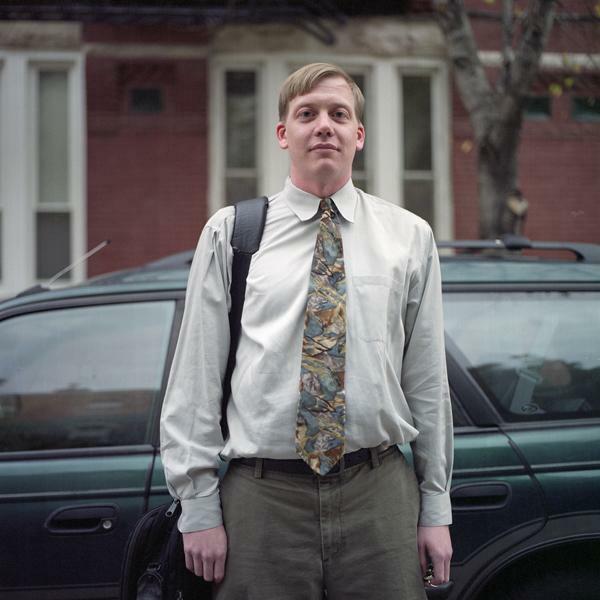 As a part of the series, students around the state are interviewing their teachers. From enslavement to the one-drop rule to the three-fifths compromise, United States law has defined African-American identity. 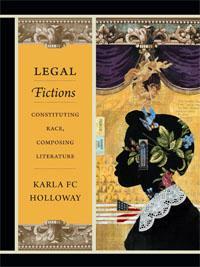 Duke University professor Karla Holloway is exploring how black fiction connect racial identity and the creation of law for African Americans. 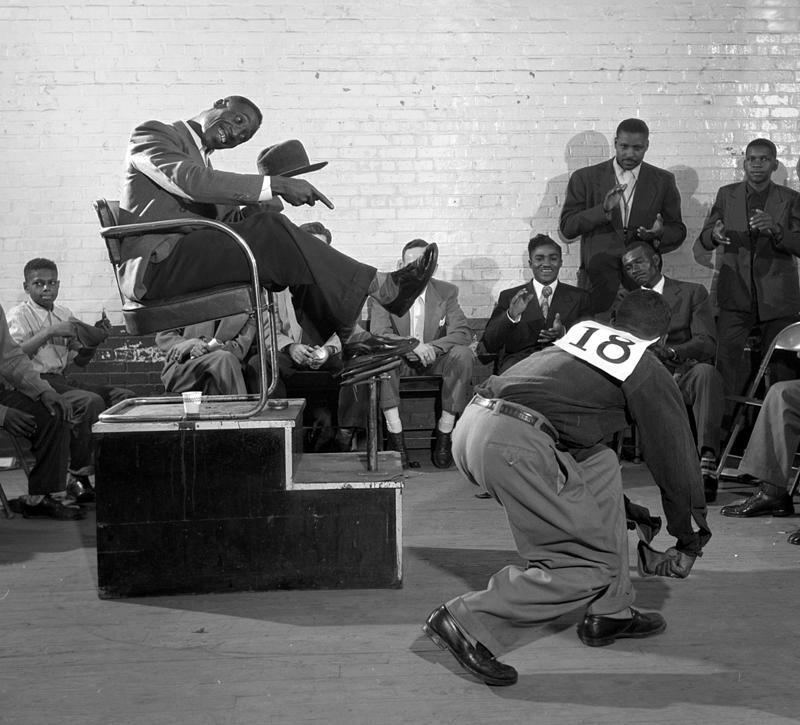 In 1952, 12,000 people in Wilson, North Carolina turned out for an amazing event; children and adults gathered to watch a world-class shoeshine competition. Locals danced and played music, competing on showmanship, not just the quality of their shine. The event was photographed for LIFE Magazine, but the images were never published, and they were almost lost to history.